J.D. Irving’s proposed concept plan asks the Maine Land Use Planning Commission to allow new commercial and residential development around the lakes in addition to conservation plans and continued logging operations. 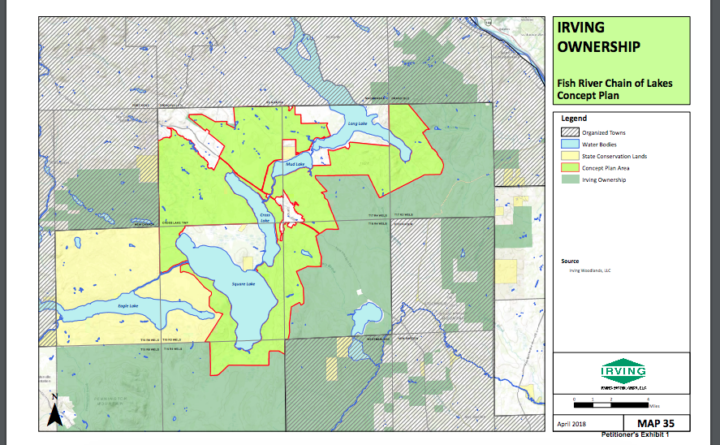 The public gets its first opportunity to comment on a plan to rezone 51,000 acres within the Fish River Chain of Lakes at two public hearings later this month in northern Maine. Hourihan said the company has been working on the plan for five years. Irving owns 1.3 million acres of Maine forestland, including the large swaths of land in the Fish River Chain of Lakes to the east of the North Maine Woods. The land around the lakes is largely working timberland, but also is home to more than 400 lakefront camps on Cross, Square, Mud and Long lakes. Irving formally filed a petition to rezone the land in 2014, spent the last three years working with consultants, and released the multi-volume concept plan proposal last summer. The concept plan lays out a vision for the area over the next 30 years, including rezoning certain sections to allow commercial and residential development. Under the plan, about 1,900 of the total 51,000 acres would be rezoned to allow development, with 1,300 acres slated for as many as 330 new residential lots and additional acres for commercial development. The plan also would put 14,600 acres into a permanent conservation easement, including almost 17 miles of shoreline on the four lakes. The rest of the land would largely remain as timberland. As part of the planning process, but not subject to any rezoning considerations, Irving is also considering the fate of more than 400 camp owners who lease the land on which their camps presently sit. Two years ago Hourihan told the Bangor Daily News his employer would consider selling those leases to the camp owners once the concept plan process was complete. In the meantime, Hourihan said the relationship between those leaseholders and Irving remains unchanged. As a group, the leaseholder’ association has also prepared testimony looking at the plan’s visions regarding water quality, road ownership and maintenance, water access and development in remote areas. At this point of the process, according to Nicholas Livesay, executive director of the Land Use Planning Commission, Irving is really fine tuning the massive concept plan. After the public hearings later this month, residents can still submit testimony through the written comment period which ends June 22.